Walking into a cold bathroom in the morning can get your day off to an unpleasant start. Shivering as you wash is not a great way to start the day and so if you’re looking for a way to make your bathroom feel warm and cosy then you may be interested in the new range of Ultraheat heated towel rails and Ultraheat radiators that we have added to our website today. Reliability is the emphasis of the whole Ultraheat range and these radiators and heated towel rails offer great value for money whilst also looking strikingly attractive. They range from cutting edge modern designs to the more traditional and so there’s bound to be something for every taste. No matter which ones you choose you can rest assured that high standards of quality and engineering mean that all the products in the range combine beauty with effective responsive heating. They are all designed and created from quality mild steel and polished to a gleaming mirror finish. The Portofino towel rail (pictured above), for example, not only looks stylish but is incredibly practical as it functions as both a rail for hanging towels, and a shelf that will take a bundle of folded towels aswell. The Ultraheat Kensington towel rail for example combines the period style of the chrome towel rails with the Ultraheat compact and planal steel convector radiators to give the ultimate bathroom comfort. There are six different sizes/power outputs in the range to choose from and with a five year warranty you can rest assured you are getting a quality product that will give you excellent performance for many years. The Poplar heated towel rail is one of the bestselling wall mounted towel rails and features designer sleek flat bars creating a ultra slim look perfect for the modern bathroom. It is available in a number of different sizes in chrome, white or the increasingly popular black finish. Black heated towel rails have gained popularity recently and their stylish look will suit anyone wanting to keep up with the latest trends. You will find the full range of Ultraheat towel rails along with a large range of radiators and valves and accessories here. 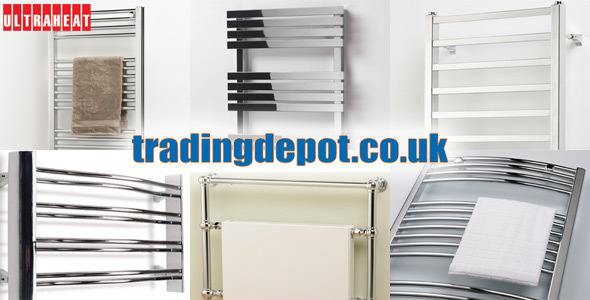 The Ultraheat heated towel rails section of the Trading Depot website can be found alongside Delonghi heated towel rails in the Radiators / Towel Rails section of the website. Trading Depot supply the DIY and Home Improvement market selling to both Trade and the general public at low internet prices. You can call Sales on 01628 760 440 to check stock and availability, or buy online 24 hours a day at www.tradingdepot.co.uk. We update the blog regularly so check back regularly and don’t forget you can Follow us on Twitter, Like us on facebook, or take a look at the Trading Depot Youtube Channel.